This Burgle Bros. review was made after playing the game nine times. 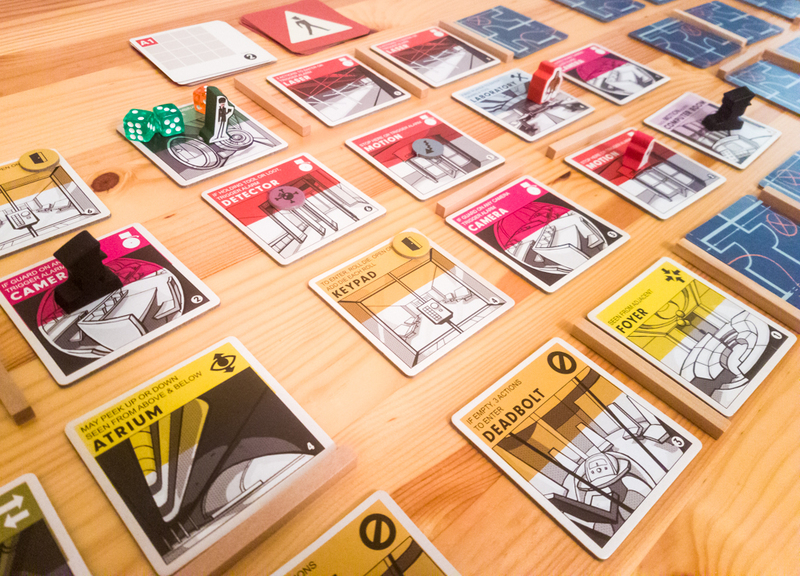 Burgle Bros. is a thematic cooperative game from Tim Fowers and Fowers Games where players are a group of robbers trying to pull off a huge heist. To win, you have to get through three floors, three safes and past all of the guards to get to the escape helicopter on the roof. If even one player is caught by a guard, everyone loses. 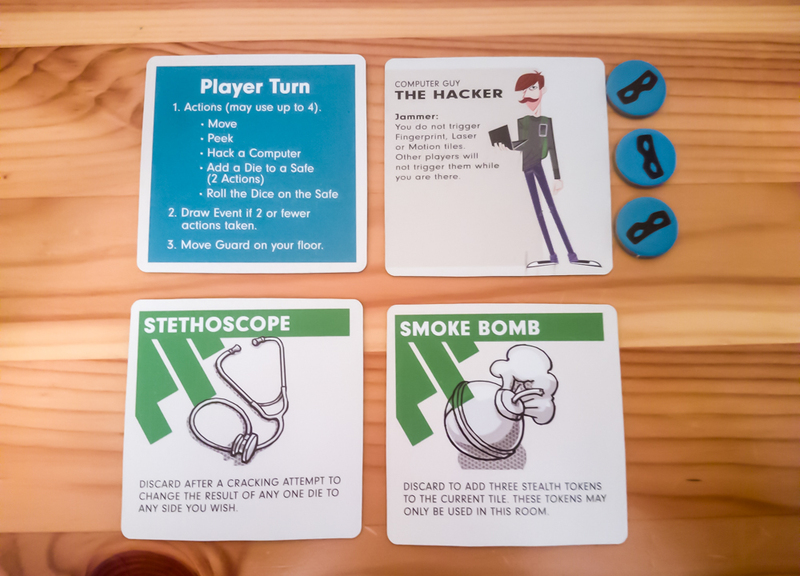 At the beginning of Burgle Bros., each player selects a random burglar that has a unique ability. The levels of the building are randomly created by placing tiles face down, with wooden logs placed between them to represent walls. In the rooms you’ll find alarms, obstacles, computers to hack, or a staircase to the next level. Players can also find tools, items, and events that can be either good or bad for the team. peaking into a room by flipping an adjacent tile. revealing a room by entering it, which is riskier than peaking but lets you move quicker. adding a die to a safe tile for future cracking attempts. attempting to crack the safe. Safes are cracked by rolling dice and trying to match the numbers found on all of the rooms in the rows horizontally and vertically adjacent to the safes. You can add dice to the safe tile by using two of your actions, and you can roll all of the dice currently on the tile for one action. After a player is done with his or her actions, the guard on that floor takes his turn. The guards move around the current player’s floor at different speeds, either toward an active alarm or toward the location marked on the current Patrol card. Once a guard has reached his destination, a new Patrol card is drawn and the guard will start moving toward that room. If a player is caught on the same tile as a guard, they have to spend a stealth point. If anyone ever runs out of stealth and they run into the guard, they are automatically caught and the game is over. You win if you’re able to crack all of the safes and make it up to the roof. Burgle Bros. is strongly thematic and uses that theme to put pressure on the players. With the continual sense that the guard could catch you or an alarm could be triggered, it builds tension among the players and is a real driving force behind the action. Speaking of theme, the fact that it actually feels like you are in an Oceans 11 type of environment makes it very easy to teach. We’ve always thought of Forbidden Island as being one of the best gateway co-op board games, but Burgle Bros. might be an even better gateway game since most people will recognize how it works quite quickly. Even though there aren’t a ton of cooperative actions, there is plenty of cooperation in this game. You have to work together to make sure everyone avoids the guards, which means you might need to switch floors to keep a guard from moving or you might even purposely trigger an alarm to help out a teammate. Gameplay is super-smooth. Do your four actions and then move the guard on your floor. That’s it! The way that the board is initially set up is entirely random, so even the same group of people replaying this game will get entirely new experiences every time. Burgle Bros. takes up a ton of table space, especially when playing the standard, three-level game. If you’re playing a three or four-player game, expect to have to move around a bit or have someone else move your character for you. I like the unique small box that Fowers Games uses, but ‘s not easy to get the tiles, cards, and rulebook to fit in the box. I should point out that Burgle Bros. can run pretty long if you play the full three-level game. Don’t be surprised – especially in your first three or four playthroughs – if the game ends up lasting around two hours. Burgle Bros. is an excellent game for people who like board games with a lot of tension. 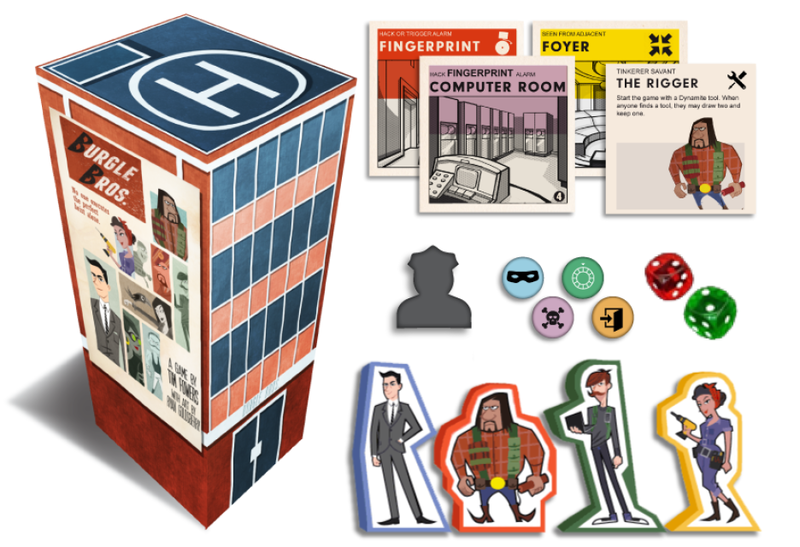 If you love heist movies and want to put yourself in the action, you will probably enjoy Burgle Bros. as much as my group does. It’s definitely one of the best family co-op games out there right now, and it happens to be in our top 15 co-op board games. There’s no other game like Burgle Bros. on the market right now, so it’ll probably stay in our game rotation for a long time. You can can give the game a try by getting the Burgle Bros. app for iOS and Android. Thanks for taking the time to read our Burgle Bros. review! To stay updated on all things cooperative board games, follow us on Twitter, Facebook, or via RSS.